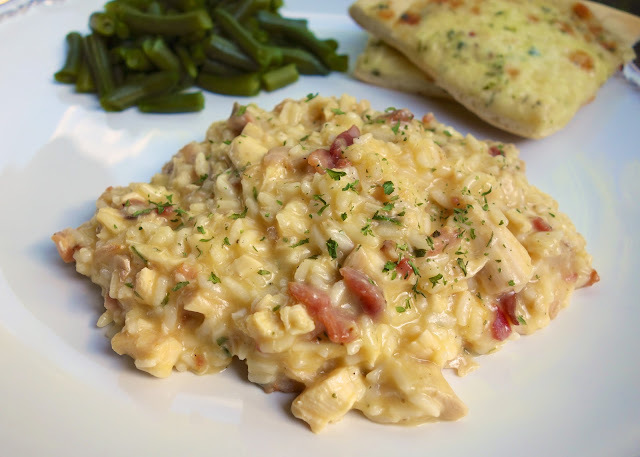 Stovetop Cracked Out Chicken and Rice recipe- dinner in 15 minutes!!! Chicken and Rice loaded with cheddar, bacon and ranch. Great weeknight meal. Everyone cleans their plate!! Several people commented on my Baked Cracked Out Chicken and Rice that they had a hard time getting the rice to cook. I have never had any issues with the rice cooking, so I wasn't really sure what the problem was. I decided to make a stovetop version with instant rice in hopes the rice would cook easier. This is SO simple! It is actually much easier and faster than the original. I like to use chopped rotisserie chicken in this dish. It really cut down on the prep time. This only took about 20 minutes from start to finish. You can't beat that! Chicken Legs raved about this version. He went back for seconds. This was also great reheated for lunch the next day. Give this a try the next time you need a quick weeknight meal! In a large pot combine cream of chicken soup, chicken broth and rice and bring to a boil. Stir in remaining ingredients. Cover and simmer for 15 minutes. Serve immediately. I love finding new simple recipes. This one looks so good I can't wait to cook it for my family. This is on the menu for this week but I was wondering if it comes out on the salty side with using the whole packet of ranch dressing mix? Lisa - if you are concerned that it will be too salty, you can cut the Ranch down - add half of it and taste it to see if you want to add any more before serving. Enjoy! this is simmeridig right now. cannot wait to dig in! and I'm so excited I obviously can't spell simmering! Stephanie, I ended up making it last night and used just a little over half of the packet. I personally found it a bit salty still but added a bit more cheese and it seemed to balance out. Rest of the family loved it...one of my daughters doesn't like cheese with her chicken (I can't believe she is my child!!!) so I didn't add the cheese till last and pulled her a serving out. I tasted it and she loved it. I can't believe I missed this post. I've been spending the past month looking at your original recipe wondering how I could do it stovetop, and suddenly this. You are literally my hero. So I just made this. And it's amazing. Made this last night for dinner. It was yummy and so very EASY!! 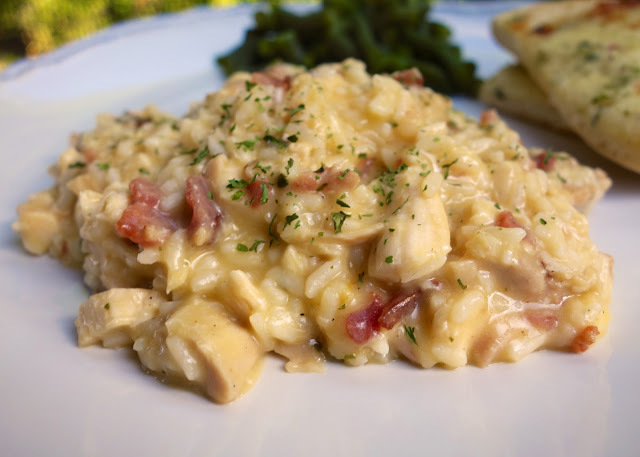 I loved that it helped me to utilize some leftover chicken breasts and bacon. I did not make any modifications to the recipe other than to add a small amount of milk to thin it out a little. Next time I might add some sautéed onions and a small can of mushrooms, but it was excellent just the way it was. (And it seemed to taste even better the next day.) Thanks for the addition to the dinner rotation! Oh my gosh! Made this tonight with the help of my littles who taste as they go and informed me it was too "crunchy" after we blended the ingredients. But at the end, all three of us girls agree it is a winner. Thanks for the photos which make menu planning with a 6 an 8 year old so much fun. Even better the next day!! This is a great make-ahead dish, and it is SO quick making it on the stovetop. Definitely use reduced sodium soup and broth because it can be a little salty with the entire packet of ranch. This will be a great dish to take when someone is sick/has a baby/potluck, etc. This turned out pretty good! Thanks. Can you make this with a can of cheddar cheese soup instead if the shredded cheese, I just started making this and realized that I don't have shredded cheese?